So, you know when your choices are 1) wake up super early to get your loaves in the oven and have fresh bread or 2) don’t bother baking because your day is really busy and go without the bread… Clearly, the right answer is to wake up and bake. Am I right? Well anyway, that’s what happened to me this weekend and here is the consequence of my choice. This loaf has become my little project and I must say, I prefer the result I got this time. The crumb is noticeably softer and melty in mouth. Yum… I let this one have a much longer shaped proof (3.5 hours instead of 1.25hours) and retarded it for 8 hours instead of 14hours. 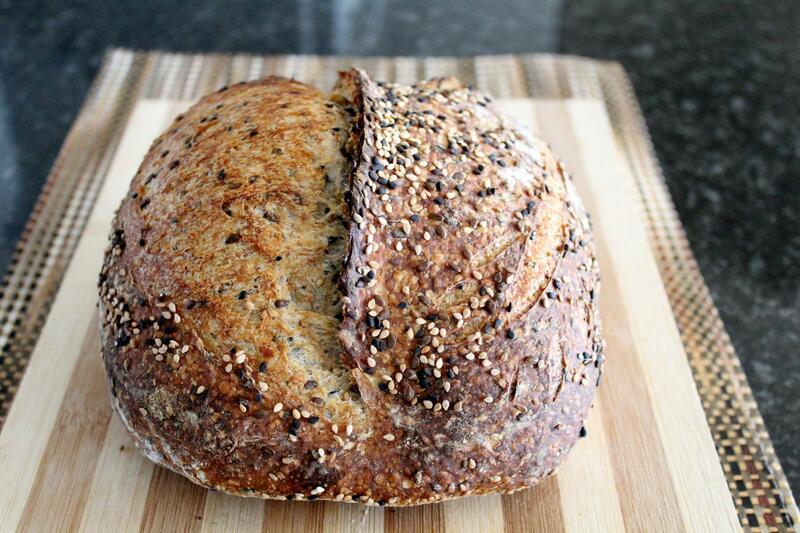 The next loaf was a seeded loaf… nothing fancy, just a mix of white and black sesame seeds and linseeds. I’ve made a seeded SD loaf before and I really enjoyed it but I thought that the seeds sucked a lot of moisture out of my dough. So this time I toasted the seeds and soaked them in boiling water overnight before putting them in the dough. I put just enough water so that it would all be absorbed, I didn’t want extra water to end up in my dough. 1. 1 stage 12 hour levain build. 20 g NMNF rye starter plus 45g whole wheat flour and 36g water. 2. “Pre mix” the flour and water for the dough the night before mixing, chill in the fridge for a few hours and leave to come to room temperature overnight. Toast the seeds and soak in 55g of boiling water. 3. Add the salt, levain and seeds to the dough and mix. 4. Pre shape and let the dough rest for 30mins. 5. Shape and let the dough sit in the basket for 3.5hours before refrigerating for 8 hours. 6. Baked at 250 dC for 20mins with steam and then at 230 dC for another 25mins. Slicing this loaf was amazing! The aroma of the seeds was just so good…I was worried that I didn't have enough seeds in the dough, but I think I got just the right amount. Soaking the seeds was a good idea, the crumb is nice a moist because the seeds didn’t steal as much water from the rest of the dough. those loaves are a joy to see...from inside and out! Just beautiful! Especially as I am on a 'get that beautiful ear' mission and I think it is my shaping (without enough tension) and potentially overproofing that is at fault rather than my scoring itself....Do you do your final shaping with a lot of tension? I know, really stupid question a la how long is a piece of string? I try and get as much tension as I can without destroying the dough when I shape.It really does help with the rise and the ear .Also, one quick motion helps get a clean line. What do you use to score your dough? I'm playing around with how far I let the dough proof before and after shaping to get the right balance. At the moment I'm tending towards a longer shaped proof. So I'm trying to stick to the same formula, it helps track what causes the differences. 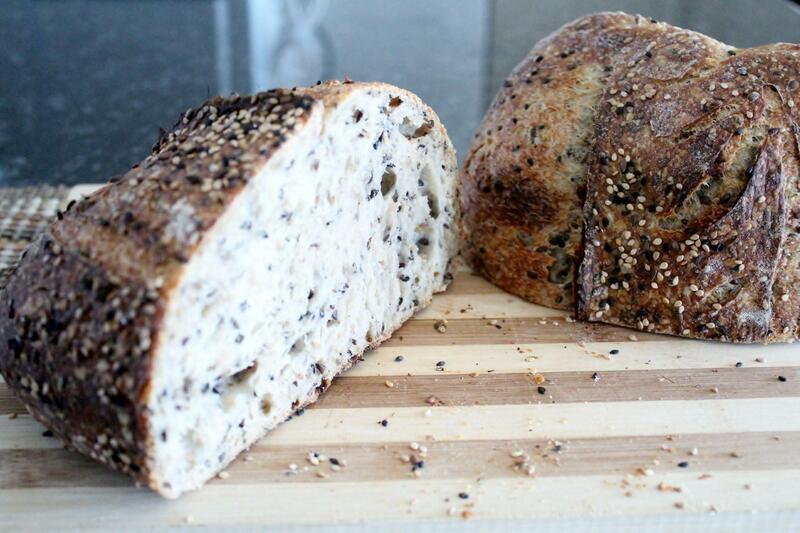 Let me know what you think of the seeded loaf when you get around to it. No need to be even a tiny bit green, you're a fantastic baker!! from a lady to show the amount of tension needed for a good ear and I think I looking at that and your thoughts I tend to go too easy on the shaping or overproof a tad or both as I don't have quite the tension as in her IG post. Is this how your loaf feels before you turn it over and score? the perfect balance. The thing is I tend to bake my loaves straight from the fridge, so the dough isn't as bouncy, its a lot firmer than the dough in the video. maybe I should try letting the dough warm up to room temp before baking and see what it feels like. But I agree with you, getting that tension is tough. I'm still training my hands to be firm but gentle. I'm trying to find the right time to shape, before the dough is too gassy but not too soon either. I think it helps to pre shape the dough fairly tightly too. Yup, just a plain old razor is what I use to score, I think it helps to score cold dough too. I'm cheering for you to get that ear Kat!! Looking forward to seeing how you get on! inside and out! Attractive and artistic scoring! So glad you are back, Ru! I guess you made the right choice, Ru! What a pleasure to the eye; but where do we start the tasting queue? Your work with the lame (or whatever implement you use) suggests you could have a deft hand with a scalpel; a plastic surgeon by any chance? Ha-ha! would have made a great doctor, I'm actually very squeamish! I wish we could all have one big tasting party of everyone loaves! That would be fun! I just use a razor to score, I thought about buying a lame but the razor seems to get the job done! Thanks for the complement, much appreciated! Second one down - that is amazing. That is really high praise, I'm flattered. Those are just glorious. Are you sure you didn't do any baking while you were MIA? Sure looks like you've got it all mastered. I'm really impressed. I can barely do one type at a time. how you do 2 and others 3 I've not got a clue. LOL! Nope no baking while I was away :) You know what, I actually think that I bake better when I'm happier, my dough can probably sense it! Thank you for the kind words, I really appreciate it. I think I'm still a ways away from mastering the art of bread baking though, I've still got like 9950 or loaves to go! LOL! "5. Shape and let the dough sit in the basket for 3.5hours an hour before refrigerating for 8 hours." This line confuses me. Specifically the phrase "an hour" does not seem to fit. Should the sentence read "3.5 hours before refrigerating ..."? I've corrected the post, you're absolutely right. Thanks you for the complement! I can't wait to get to a point in my life where 20 mins of sleep is enough! I'm glad you liked the post :) Happy Baking!! hyperbolic exaggeration not at all based on any facts. whatsoever I'm pretty sure I get 3 or 4 hours a night maybe 5 on a good night most of the time and Lucy gets 18 hours a day to make up for my restlessness but she is 98 in human terms:-) Wow ....a Cover Shot Bread, Nice! Congrats all around. I figured 20mins might be too little, but wouldn't it be great to actually have more than 23 hours in a day. Lucy can put that on her list of apps to work on! Thank you for the congratulations Dab, appreciated!! Wow, these are fantastic. Would you mind if I featured this post on the homepage for a bit? I would be honoured! I'm glad you liked the post. Lady, you are something else! 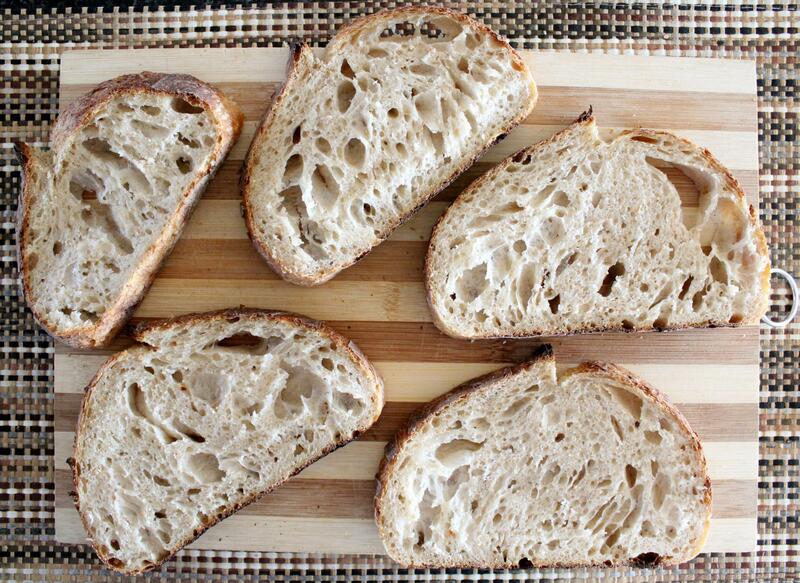 Beautiful breads, inside and out -- every time! Enjoy them. Looking forward to the next ones. I really appreciate the kind words, you're so generous! Ru.. what amazing looking loaves! You were on the board making loaves, struggling here and there.. then you go away for a while.. now you're back and BAM! Wow, your loaves are remarkable looking! To say 'well done' seems like an understatement! I'm going to have to make one of your breads when I get a chance - they look too good to pass up. Will bookmark this post.. and the photography just makes them all the more mouthwatering! You're too kind, I really appreciate your kind words. I was just saying to Hester, I think being happier (and a little less rigid) has helped me with my baking. As for the photography, that;s just a new thing that I'm exploring! Let me know how the formulae work for you when you get around to it. I'd love to hear what you think! I just have to repeat this, your already great baking and photography have vastly improved! Excellent! Maybe long breaks do improve skills! But I think, being a happy baker is the best way to be better! I'm happy you liked the post. Maybe you can do a video of yourself baking from start to finish when you have extra time. I'am sure many of us will learn. and the rest of us 007's - a match made in heaven:-) Great Idea Job. I'm far too camera shy for making movies... But who knows...maybe I'll muster up the courage one day ;) But if I take to being in front of the camera instead of behind it, I might have to move to Hollywood and become a celebrity! I'm not that brave yet! Sooooo glad you are back! Your bread photos are amazing! 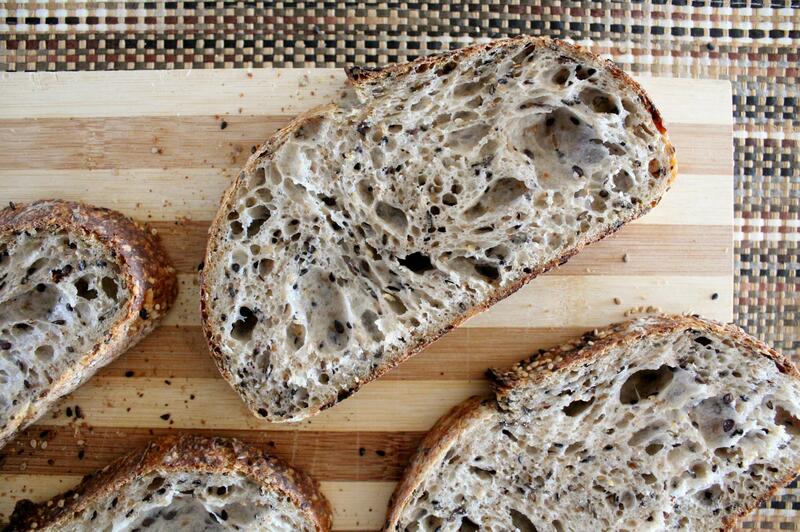 I think the crumb on that seeded loaf is absolute perfection, really. Well, and everything else too! I appreciate that! I'm really happy to be here again, we have such a great community here! those are beautiful, inside and out. 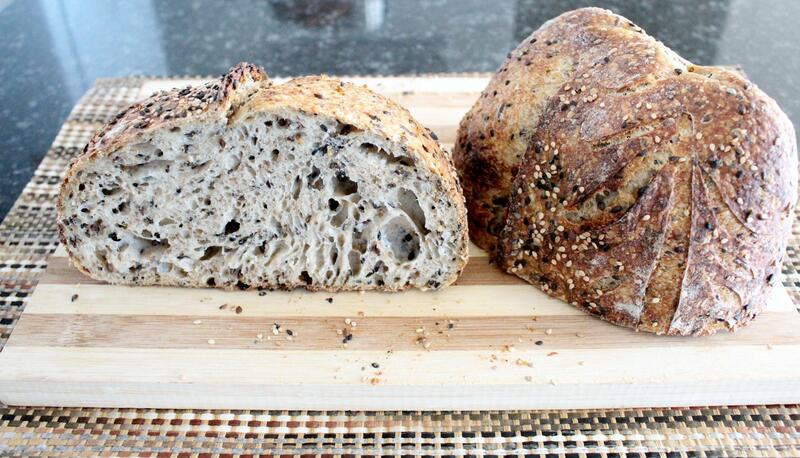 The crumb on the sesame loaf is wonderful - and I bet the aroma was amazing! you are on a roll, Ru!! keep baking happy and posting, and have a great week too! That's so kind of you! I'm glad you liked the post. That is some great looking breads. The seeded one has me drooling. Really! Outstanding in every imaginable way. Those are amazing! I booked marked these for the future. They are just lovely inside and out! You wrote that you pre-mixed (flour & water) then chilled a couple of hours, after that left out on the cabinet overnight. A number of us have tried that technique without success. We used it when baking Trevor’s Champlain SD. The only difference is Trevor added the salt during the initial mix. But, if I remember right, all of us had to abandon that part because our doughs degraded beyond use. Any idea why you succeeded when others failed? And you did it @ 80% while we were using 75%. Was it your flour or room temp? I’m sure Leslie, Kat, myself and a number of others would appreciate your thoughts on this. Another question. I’m interested to learn about the the 3.5 hour proof at RT before refrigerating for 8 hours. How would you describe the degree of proof before refrigerating? I am exploring this at this time with good results for open crumb. Is this something that you normally do? my room temp has been really cold lately. I'm not sure what it is overnight, but in the early mornings its usually about 5 - 6 dC (41F) and its doesn't get too warm in the day either, we're maxing out at about 18 - 20dC (64 - 68F), so that's why everything is taking so long. But I'm not 100% convinced that it's the temperature, because I've done this before in the summer and my dough didn't degrade. I've only had a dough degrading incident once before, and that was a loaf that had a fairly high amount of rye in it. So it might be the flour, and the enzyme activity? My loaves are mostly white with a bit of whole wheat (I've never used spelt). Here is a link to the flour I use http://www.eurekamills.co.za/our-range/ I'm not sure how much information that will give you though? 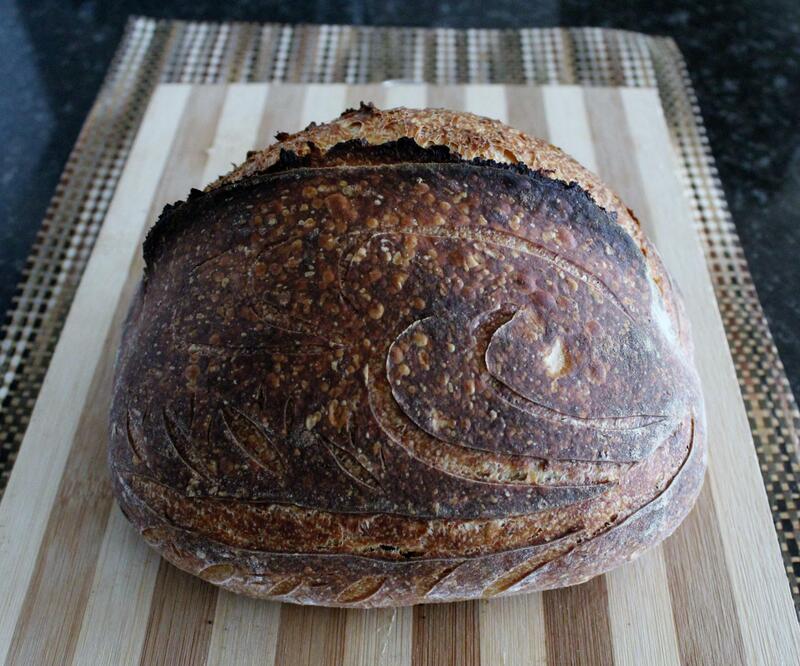 As for the Champlain Sourdough, I've finally managed to get my hands on some spelt flour (happy dance!) if it arrives in time, I'll try it this weekend and post in the Champlain sourdough thread. If my dough survives, then its probably the temperature. I'll do it exactly as Trevor does and then we can compare notes! The last couple of bakes, I had left the salt in the premix, this time I left out for no other reason than I wanted to see what would happen. The dough didn't feel any weaker to me or like it had degraded. My next experiment is to do the same loaf and only do a 2 hour autolyse. After the 3.5hours the dough looked really close to being ready to bake. I'd say it was a 80% proof. After I asked you about your longer shaped proof, I decided to push the shaped proof a little further, because my dough does next to nothing in the fridge over night. Its not something I normally do, usually I only leave it out for about an hour, but I'm trying to not look at the clock so much and learn to read my dough more. It seems to like the longer shaped proof. I'm actually going to try to push it even further next time. Just to see. Sorry for the long winded answer, which i don't think was that helpful, i'm just thinking out loud here! Thanks Ru, I loved your “long winded answer”. It was informative. I’m from the southern USA, Kat in England and Leslie is in New Zealand. So our temperatures really vary at a given time of year. We tried the overnight pre-mix many times each. We all ended up,with dough that was very very slack. I am interested to read your findings on the Champlain SD post. Up until recently, I would refrigerate my dough immediately after shaping and putting into the banneton. So far, proofing at RT to about 80% done and then refrigerating is producing more open crumb. Wow....that's the first word I thought when I saw your post Ru, just wow!! Those are fabulous loaves and so beautifully crafted. I really like the look of both of them, the seeded loaf is delicious looking but the mostly white SD is my favourite, a thing of beauty with the dark bake and intricate scoring pattern. You have really got it going Ru, those are artisan breads in the truest sense of the word, very well done, just a great bake all around, very impressed! I've been looking around for scoring inspiration and trying to put my own spin on it. I'm looking for a "signature"! LOL! It's something I had never really tried before, who knew what fun there was to be had in scoring! I'm so happy you liked the post and thank you for the kind words, its so encouraging and always appreciated. It's so good to here from you! But those are fantastic. Proofing has proved to be one of my biggest challenges, you nailed it on these. I'm glad you liked the post! I totally agreed, proofing is a tough one. I'm still trying to practice as much as I can and learn to read my dough better, in stead of baking and hoping! 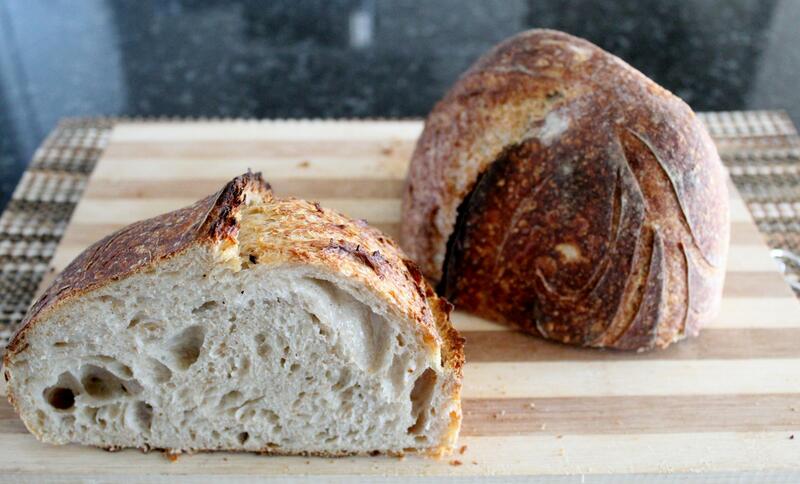 Not much to add, but lovely scoring and crumb and crust...what else do you need? Each time I get ready for a new recipe, I prepare a timeline with the steps and a rough target time for each step so that I can gauge when I might be at a particular stage in the process. In reading through your recipe and doing a timeline, I have some questions. (1) Was the "pre-mix" the equivalent of mixing to the point of a shaggy dough as would precede an autolyse phase? (2) Did you soak the seeds first thing in the morning? Or did the soaking occur at the same time as the pre-mix of the flour and water? A related question is did you let the seeds soak for a long time? Long enough for the water to cool to room temperature? 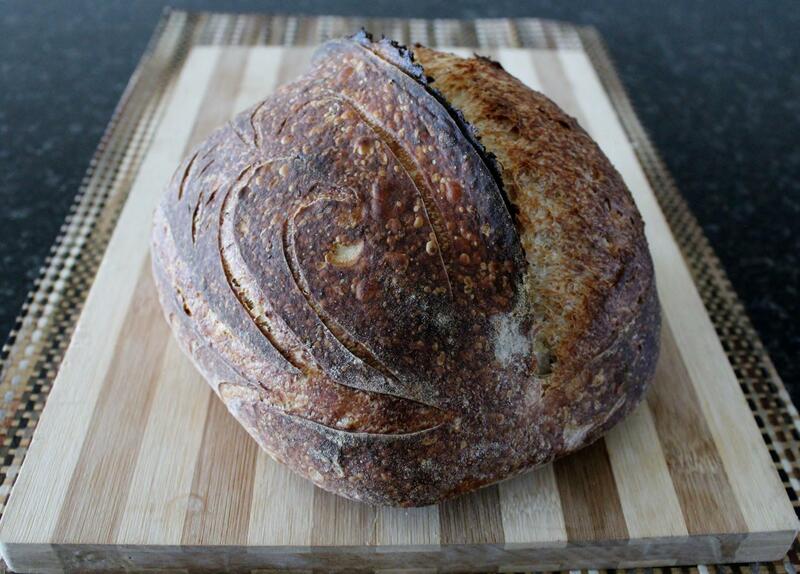 (3) What time of day did you start the mixing of the dough, salt, levain, and seeds? I am having trouble figuring out how to fit this into one day. First there was the 50 minutes of initial mixing (the 10 mins rest x 4 phase) and then another 2-3 hours during which the stretch-and-folds occurred. That was followed by 5 more hours of bulk fermentation. Then a 30 minute bench rest. Then a room temperature proofing for 3.5 hours and then a stint in the fridge for 8 hours. That all adds up roughly to 20.5 hours. (4) Now that it is summer and kitchens are warmer, some of the process might take less time (e.g., the bulk fermentation and the pre-refrigeration proofing), but it still seems that the baking itself will occur at some odd hour. Am I missing something? This seems to be a great bread, but I am a bit stumped on how to fit this recipe into a reasonable timeline.